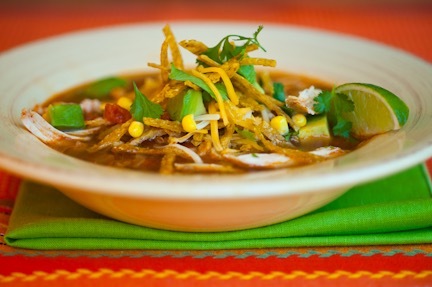 This chunky chicken soup flavored with cumin, chili and lime is served with a variety of toppings that include avocado, fresh cilantro and crisp tortilla strips. Served with a leafy green or festive quinoa salad, it makes a nice combination for a casual dinner party. Everything can be done ahead and passed at the table. Preheat the oven to 350°. Rub chicken breasts with 1 tablespoon olive oil and sprinkle with salt. Place on a baking sheet and roast until just cooking, 40 to 45 minutes. Ideally, the chicken will be slightly undercooked, and finish cooking in the soup for optimal tenderness. When chicken is cool enough to handle, shred by hand into strips. Leave the oven on. Cut tortillas in half, and then cut each half into 1/4-inch strips. Place on a baking sheet, and drizzle with 1 tablespoon of the olive oil and a sprinkling of salt. Mix with tongs. Bake until lightly crispy, turning occasionally with tongs, 10 to 12 minutes. In a soup pot over medium-low heat, sauté the leek and garlic in the remaining 1 tablespoon of olive oil on medium-low heat for 1 to 2 minutes, stirring often. Stir in the chili powder and cumin and continue stirring for 30 seconds until fragrant. Add stock, tomatoes and 1 teaspoon salt and bring to a boil. Turn heat to low and simmer soup for 10 minutes, covered. Add the corn and simmer for an additional 5 minutes. Just before serving, add the chicken, heat gently, and adjust the salt, adding more to taste. Arrange the tortilla strips and other toppings on a platter. Ladle the soup into bowls and pass the toppings. Don’t forget the squeeze of lime juice, it enlivens the soup.